The number of people who are considered clinically obese has actually tripled in the last 25 years, making obesity a growing concern for doctors and health professionals. Obesity is also becoming more frequently seen amongst children. I would like to take a step back and think about some of the reasons why obesity has increased so rapidly, and also think about ways in which the issue could potentially be resolved. First of all let’s define ‘obesity’. It is ultimately a medical condition in which a person has accumulated excess body fat to the extent that it starts to have a negative impact on their health. Being obese makes you susceptible to a range of conditions including type 2 diabetes, coronary heart disease, some types of cancer (bowel cancer, breast cancer) and stroke. Obesity can also affect the individual psychologically, causing depression and low self-esteem. The condition can impact the day to day life of the person as well. Some of the problems that can be experienced include: feeling very tired, joint and back pain and breathlessness. Medical conditions and genetic factors can predispose a person to becoming obese, however, the main reason for obesity is based on people having unhealthy diets and not partaking in enough exercise. It usually develops gradually and can be largely attributed to lifestyle choices. In terms of diet, there is a concern that people are overeating and also have diets of which a large proportion is sugar and fat. A recent study revealed that an area of the brain related to addiction and reward is activated when a participant is shown calorie rich, fatty foods compared to healthy food. This explains why it is so difficult for people to eat more healthily. Unhealthy foods are essentially addictive and they include foods such as processed fast food, fizzy drinks, chocolates, the list is endless. Aside from that, any sort of overeating will lead to obesity as the excess calories that you would have consumed will simply be stored as fat. Eating out a lot can contribute to this problem as it will mean that you are consistently eating three courses for your meals, which is just far too much in terms of the energy that you actually need. Comfort eating also has a role to play. Feeling depressed or having low self esteem can cause a person to overeat, which in time will cause obesity. When they become obese they could lack even more self esteem, relying on comfort eating more…causing the problem to escalate in a vicious cycle. Alcoholism is another issue in today’s society and this also supports the obesity crisis. Alcohol contains a lot of calories so excessive drinking can lead to obesity. One of the main worries with regards to the overeating aspect of obesity is that these bad habits can be passed from parent to child, which is probably the reason why we are seeing a surge in the number of obese children. Behaviours are shaped in childhood, so if children get into the habit of eating too much at a young age we can only worry about the greater problems they will face in adulthood. Being overweight or obese has also shown to have a significant impact on children’s social and emotional health. Some people are worried that if this issue is not addressed we will be at risk of raising the first generation of children who will not outlive their parents. Lack of physical activity is another important factor related to obesity. It can be argued that the technological lives we lead today has made us lazy. We no longer have to walk from place to place as we have cars. Our relaxation activities have changed from sporting games to watching TV or playing computer games. Even in the workplace, a lot of people have jobs which involve sitting at a desk the whole day. People seem to just not be able to spend time engaging in physical activity. The recommendation is that adults spend two a half hours exerting themselves to the extent that they are out of breath or sweating every week. I think it’s safe to say a lot of people don’t do that. 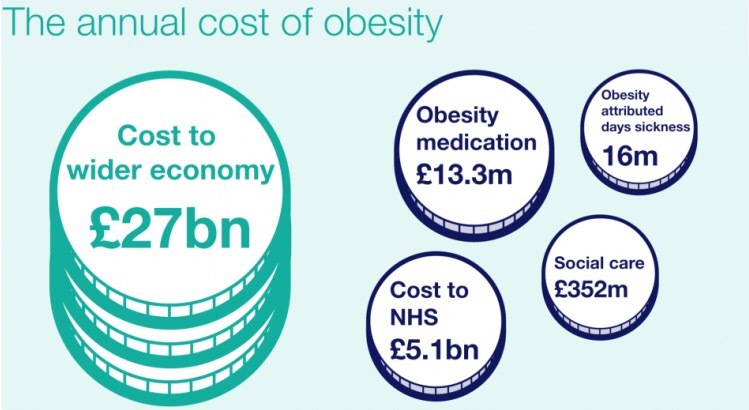 How can we stop the Obesity crisis? Bariatric surgery is an option for some severely obese people to help them lose wait, but this option is by no means scalable to every single obese person. Surgery poses risks and it’s simply not feasible or financially possible to take this road. The best way to reduce the numbers of obese people is by encouraging people to eat smaller more healthier portions and exercise regularly. There are several ways this can be done. More money should definitely be invested in health education and warning people of the risks of overeating. Campaigns could be held in schools where children are taught to choose healthy foods. TVs are a good place to advertise health which would reach a large number of people. Food companies could be worked with to lower the percentage of fat and sugar in their products. It has also been suggested that certain unhealthy foods such as fizzy drinks should be taxed, however, this is very controversial due to the fact that it could be more of as a tax on the poor as they will be the ones most affected by the implementation of this. Food companies should label their products better, making it clear exactly how much fat and sugar a product contains. One suggestion is that, all packaging lists the amount of exercise that will need to be done in order to burn of the calories from consuming the product. People should be encouraged to take up physical activity. Schools should include more sports in their curriculum and become involved with youth clubs where more children could engage in sporting activities. We could also look at certain areas which may not have access to a leisure centre and perhaps consider making these services more accessible to everyone. The government could provide funding to pay for gym memberships for people who can’t afford to pay for them. There are many ways physical activity can be encouraged, but we just need to become more involved in doing it. Since many people use technology on a daily basis we could even use this as a mechanism to promote a healthy lifestyle. Weight management apps can be developed or apps that monitor your physical activity. And of course, alongside all this, people must have access to good professional support.